The fish of 10,000 casts awaits you! So this Saturday is the third Saturday in June and in Ontario's Sunset Country, that can only mean one thing - muskie season opens! For any person who likes to fish for muskie, Ontario - and Sunset Country in particular - is a dream destination. Our muskies up here are relatively unpressured and with the "big girls" on some of the lakes pushing 55 inches and 40 pounds, catching one that size is definitely something to strive for. We've got some big name waters up here for sure, Eagle Lake, Lake of the Woods, Lac Seul all harbor giant fish - as does Rainy Lake and Upper and Lower Manitou lakes. But those lakes only scratch the surface, there are many smaller lakes that can give you both good numbers and size. In this article, I want to share my personal strategies for fishing muskie early in the season, try them or disregard them, but have fun! When it comes to big muskie, we have an ample population! Image courtesy of Andy Myers Lodge. If you fish for muskie already, then the strategies you use in your home waters have a good chance of working up here too - with maybe a few modifications. As the Executive Director of Ontario's Sunset Country and living in Kenora, I get more opportunities than most other anglers to fish these waters and even though I am not always successful on any given day, I have fun every time I go. I'm certainly no expert, so I wouldn't consider these "tips". All I want to do is share some of my strategies with you and maybe you'll consider giving them a try. In spring, I prefer top-water baits and/or bucktails. The fish are post-spawn and relatively hungry as a result of the spawning process. My success rate from opening day to mid-July is better for these lures than the other ones I have in my tackle box. For colors, I almost always try to mimic the natural bait-fish population - which can vary depending on what lake I'm fishing. For top-water, I prefer Bucher top raiders - the color that has worked best for me is black and white - but I'm sure other colors work as well. I'm just a creature of habit so I try to match natural prey colors whenever possible. I like to use smaller bucktails in the early part of the season. 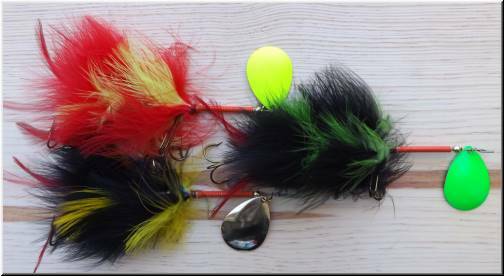 Not saying you should, but I seem to have a higher hit/follow rate using small or mid-size bucktails than bigger ones. 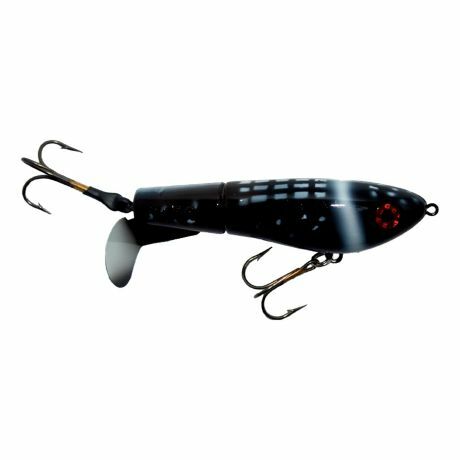 I like to "burn" bucktails over vegetation areas in the spring and smaller blades rotate faster and giver a higher-pitched sound so it seems to aggravate post-spawn muskie better than something larger that I'd use in the summer or fall. I like using bucktails with in-line blades at this time of year. Here's a good article on the different muskie blade styles available. In the spring, I tend to look for post-spawn muskie near heavier cover and calmer water like back bays. Fishing off emerging pencil reeds or cabbage grass has worked for me in the past. I think this is because sometimes, there are a few females lingering in and around the areas they have spawned. I also fish a lot of sunken/fallen timber in the first few weeks of the season and I like to use a fast retrieve in the spring. Again, I suggest you look in the back bays where there's vegetation. That's where I think most of the muskie are at this time of year. Cloudy days tend to produce more fish for me than hot, clear sunny ones, not sure why and to other muskie anglers, that observation is probably not a surprise. Picking the days you fish isn't really practical if you are up here for just a week but on those overcast days, I always have more hope than on the hot, sunny ones. My experience is the bite is best in the very early morning or right at dusk. Don't be afraid to try something different. I can remember one opening day when we were not getting any action on either top-waters or bucktails so I deiced to use a Len Thompson spoon. I cast at some timber I had been working with a top-water bait and my reward was a decent 42" fish that hit it within seconds of starting the retrieve. My point here is I normally troll big spoons in the latest part of the season, but since nothing was working on that day, I decided to try something completely different - and it worked! Luck? Maybe, but sometimes luck is what you need, along with an out of the box idea. I look for squeezes and often fish off points leading out of shallow bays. I do this because the muskie may have been spawning in these bays and as they begin to move out to the main lake, they could hang around for a while. I caught my biggest early season muskie, a 44" fish, off a point at the mouth of a mid-sized, shallow bay leading to deeper water. The reason I like trying squeezes in the lake is that they can also lead to a "corridor" effect where fish are more concentrated as they move through and there is often moving water, a good indicator any time of year. Fishing near a waterfall or stream that flows into the lake has also worked for me. I would again emphasize I don't see these as "fishing tips" - I haven't caught enough muskie to really tell anyone what they should do when they try. This article is more of a summary of my experiences fishing for muskellunge in the early part of the season and I would admit, your strategies need to change over the course of the summer as the water heats up and again, after turnover happens in September when the water begins to cool down. If you want some really good tips from an established expert in the field, then I suggest you read this interview I did with Pete Maina and definitely do what he suggests. Have a fun season out there everybody and good luck out on the water!